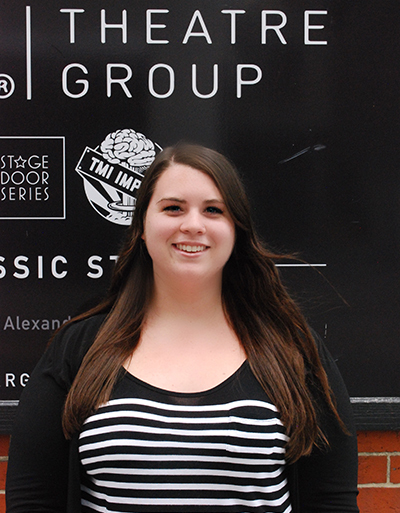 How did you land your summer internship with Gamut Theatre Group? When I decided to start looking for summer internships, I remembered that a friend of mine (who is also a student at Point Park) was previously an intern at Gamut Theatre Group. After I talked to her to learn more about the company and her experience, I knew I wanted to apply for this internship. My friend has been involved with Gamut for years so having her as a connection definitely played a huge role in helping me land this internship. Tell us about the work you did at your internship. The great part about this internship was that I was able to get so much experience in different fields of interest. I was able to create content and schedule posts on various social media platforms for performances like Free Shakespeare in the Park and a TMI Improv showcase. On the marketing side of things, I was able to gain event management experience helping to run a weekend event called KidsFest and was house manager for the three-week showcase of Free Shakespeare in the Park. For FSIP, I helped prepare for each performance, managed the volunteers who helped each night and ran Gamut's merchandise/concession tent. All of this was definitely a valuable experience. How have your SAEM classes helped you in this internship? Each SAEM class I've had so far has helped me tremendously for this internship. Taking Marketing and Promotions with Professor David Rowell and Digital Marketing with Professor Paige Beal was extremely helpful when it came to the marketing side of my internship. Additionally, Event Management with Professor Teresa Gregory prepared me for lots of encounters I had with vendors and knowing many of the dos and don'ts of managing various types of events. The great part about the SAEM classes are that the professors have so much real-world experience. They try their absolute best to share their knowledge and help prepare their students in every possible way, which in my case has been so helpful. What plans do you have for your upcoming junior year at Point Park? My junior year at Point Park will be the busiest, yet most rewarding year yet! I am the incoming advertising coordinator for the Campus Activities Board, a student organization that puts on the majority of events on campus. Since the beginning of my sophomore year, I have been extremely active in CAB and have enjoyed my time volunteering with so many awesome students. Also, I will be continuing my position with Point Park's Enrollment Marketing team as their social media intern. I will be writing and taking photos for the #PittsburghMe profiles that feature Point Park students across all majors each week and assisting Social Media Manager Felicia McKinney with helping to create content for many of Point Park's lead social media platforms. Lastly, I will be involved with the Sports, Arts and Entertainment Management Club and assisting with the marketing/event management side of a film that is being produced by a Point Park student! One of my big-picture career goals is to one day be a marketing manager or social media manager for any type of sports team, venue or theatre company. However, some of my shorter-term career goals are to continue to learn new things every day, to inspire others with the work I accomplish and to truly love what I do every day. I may not be able to get to my biggest goal right away, but I know that taking every internship, job, volunteer or networking opportunity will help me tremendously in reaching my long-term goal. Point Park University and the SAEM program have helped me an unbelievable amount. When I first applied to Point Park, I had no idea that I would gain all of the experiences that I have been so lucky to get. I feel as though Point Park prepares you significantly more for your career than many other colleges or universities by providing endless opportunities for real-world experience. I can proudly say that choosing to further my education at Point Park University has been one of the best decisions I have ever made.